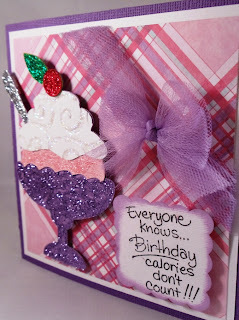 Simply Silhouette: Jen's Happy Birthday Blog Hop! 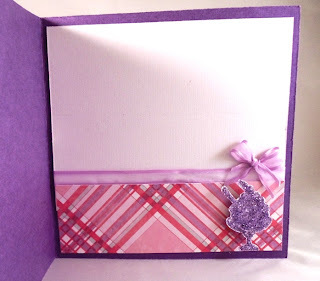 Jen's Happy Birthday Blog Hop! Great Big Huge Happy Birthday!! Go ahead and eat it up! I have some really tasty calorie free blog candy too! sure to wish Jen a Big Happy Birthday! What a great job! I love all the sparkles! I just want to eat that card up!! It really does look good enough to eat!! And I LOVE the colors!! Did you use glitter paper, or did you put the glitter on the ice cream your self?? I have to try this!! Thank you so much for being in my birthday blog hop with me!! Such a sweet Birthday card and I love the sentiment, if only it were true! TFS! Oh my that whipped topping looks so real, and what a beautiful bow, you did a delicious job on this!! This card looks good enough to eat! Great work! YUMMY for my tummy. Love, love, love this card. My bff's bday is coming up and I just might have to "lift" this. Great card ... TFS. great way to end the hop - your card made me hungry - love the sundae and the glitter .. yummie. Thanks so much for sharing and offering up some candy .. ps i am already a follower! Adorable! The bows are absolutely perfect and the glitter really makes it pop! Thanks for sharing! LOVE this card! Very yummy! What a delicious looking cupcake! I love the glittery goodness of your card!! Beautiful card! Love the glitter! And the sentiment is perfect! :) Thanks for the chance to win! This card should be entered in a hall of fame. It's amazing. I just love it. Thanks for sharing. LOVE this!! Love the sparkly look of it! OMG! This looks sooo yummy! I love it!! I LOVE LOVE LOVE this card! Yum....making me very hungry! And no calories! Would love to win those scissors...been wanting them! Thanks! What a great card! You're making me hungry. TFS your great idea. Love the fringe scissors. One thing I haven't broken down to buy, just yet. Thanks for the chance to win! This card looks delicious! I love the swirls on the whipped cream! Looks great! Thanks for the chance to win those nifty fringe scissors! Pretty and delicious all at the same time! 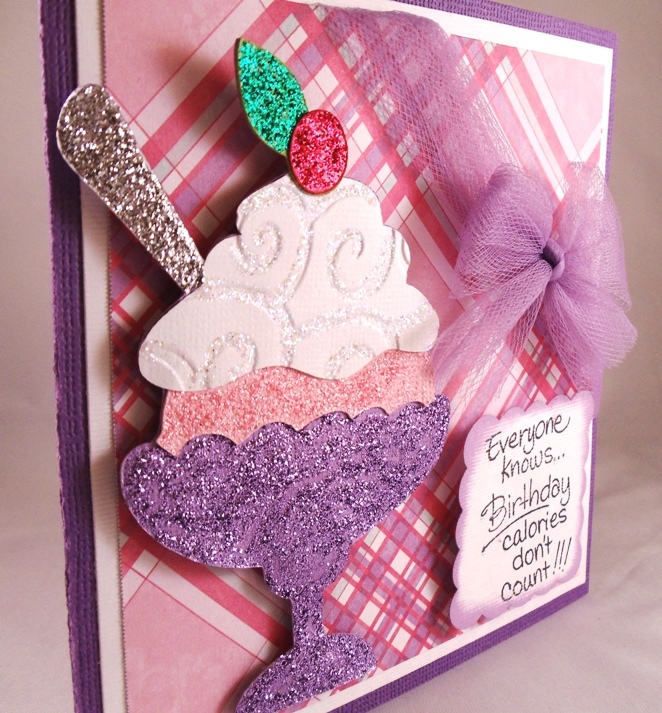 I love that you used the d'vine swirls embossing folder on the whipped cream and the patterned paper you used is awesome. Fabulous card, so pretty and blingy, I love it!! The card is absolutely scrumpt-deli-lumptious! Oh Julie, I love all the glitter and embossing too!! ADORABLE! The diagonal bow is too cute! I'll have to give it a try! Sweet how you stickled the swirls. Don't you love that folder? Your card is very beautiful and I love the sentiment. Thank You for being in the hop and sharing your card. Happy Birthday Jenn! Oh so yummy! I love all the sparkle and texture! Thanks for celebrating and sharing! Im totally addicted to crafty blogs and lovin hops that show me new crafters and ideas.Thanks for sharing . Amazing card!!! The color and the glitter make a big difference!!!!! Love it!!!! Great card! It looks good enough to eat! Thanks for the chance to win, I'm a follower. YUMMO!Look it even comes with a cherry on top! LOL..super cute card. Is that your handwriting or where can I get that font? Love it and the bow! Love your card all the glitter and looks good enough to eat!!! WOW! I absolutely LOVE your card! I showed it to my 6 yr old daughter and she said she wants to eat it! What cartridges did you use to make it? TFS I am a new follower. That is a delicious must have card. New follower, just found you today! Great card! The ice cream looks yummy! It was great being in the blog hop with you today! As soon as I saw that awesome card I had to become a follower. Love the "delicious" colors and embellishments. Love Love the card. The sundae looks good enough to eat. TFS. Oh my goodness......what a wonderful card...I love it......thanks for sharing and I would love to win. super sweet card! love all the sparkle! yummy, yummy! thanks for the inspiration! ur card is so cheery and cute! OOOOOOo purple desert ware and yummy icecream, whipped cream, now for some chocolate syrup and we are in business. TFS your wonderful card. I love your card and all the glitter! I just became a follower. LOVE LOVE LOVE the "new" bday cake...my friend Audrey will absolutely love this card....she always tells me...you made this....my response is yes with a little help from my friend!!!! I've always wanted a pair of the fringe scissors...hope I win.....THANKS!!!! I love your card, it is soooo sparkly, what did you use, stickles or is that Martha Stewart glitter? I also loved your Peter Cottontail card, too cute. I am a new follower to your blog. Thanks for sharing. Stunning and yummy card. The saying calories don't count is a perfect sentiment to add onto my daughters birthday card as she counts calories currently. Your card looks delicious. Already a follower. Thanks for sharing. That was so pretty! I absolutely love it! The card is truly scrumptious! I am a follower and have been here many a time. Thanks for all the great projects you share with all of us. Super cute card!! Love it!! Very nice embossing!! Makes me want to get a spoon and dig in, love all the sparkles and dimmensions. I can from Jen's birthday bloghop and am so glad I did!! Oh my, I've never even SEEN those Martha Stewart scissors... I'd love to give them a try! That way, I can slice my fingers into little stripes in one fell swoop, LOL!! Can you tell I flunked "scissors" in kindergarten? Your SWEET card makes me HUNGRY!!! I think I'll go see what's in the freezer as soon as I finish this hop. And HAPPY BIRTHDAY to any sweetie with a March B'day! 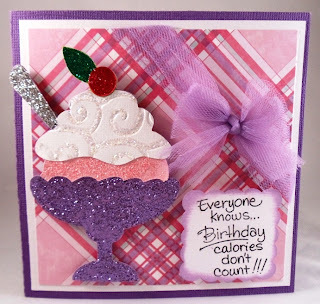 STOP BY MY BLOG TODAY to join in on another (different) birthday blog hop ... and also to learn the latest on what's up in the lawsuit case of ProvoCraft vs. Make-The-Cut. Oh my gosh so darn cute.Really cute card. I became a follower. This is the sweets for a sweet person! Happy birthday Jen!! Super Cute Card and TFS!! What a great card for the birthday girl! I love that purple tulle you added and the sparkle is perfect! Happy birthday Jen! What a sweet yummy card! I love the embossing and all the glitter. I love your card!!! I am a follower. Birthday Blessings Jen!! Have a super crafty day!!! Your card is "sweet"! Love all the glitter. WOW! What a YUMMY card. I love all of the colors. Oh my stars what a tasty card Just Delicious. Love it!!! Cute cartd, love the background you choose. I think I like it the best so far, cuz it says exactly what I'm thinking when it's my birthday! LOL! Great Job on the design...you always inspire me! Happy Birthday again to Jen from purple scrapbooker...you inspire me also! Sweet card. Love the fun elements that you added to finish off your card. The embossed icecream and decorating the inside of your card really set it off for me. Great job. Mmm. Looks yummy enough to eat. Very pretty. That card was so amazingly delicious, Thanks so much for sharing it. I have just the person to make one like it for. HAPPY BIRTHDAY JEN!!!! Thanks for doing the blog hop it has been so much fun to see all the great ideas everyone has to share. I just LOVE this card, and I love the sentiment! great job and wonderful colors. This looks so yummy. Love the sparkle! Beautiful card. I really love how you debossed the swirls and added glitter to them, the effect is stunning.